THE FLOURISH PROGRAM HAS COME TO SANDY! girls in the practical and social changes that will occur from primary school to secondary school. It will cover areas such as how to be organized, how to set goals, how to manage homework and how to get along with teachers. It will also consider how to make new friends, how to manage bullying and how to deal with peer pressure. The program will focus on positive self-esteem, making positive life choices, safe use of social media and many other important adolescent issues. The material will be presented in creative and engaging ways through the use of games, team building exercises, scenarios, visual media, discussion times and anonymous question opportunities. This will be done in the context of small groups,to encourage strong mentoring relationships between girls and their mentor leaders. Consequently, only limited places are available.The program will run between various dates in July to November, Friday evenings 7pm until 9pm at the hosting venue, Sandringham Baptist Church.This program contains no religious material." SIGN UP TODAY! 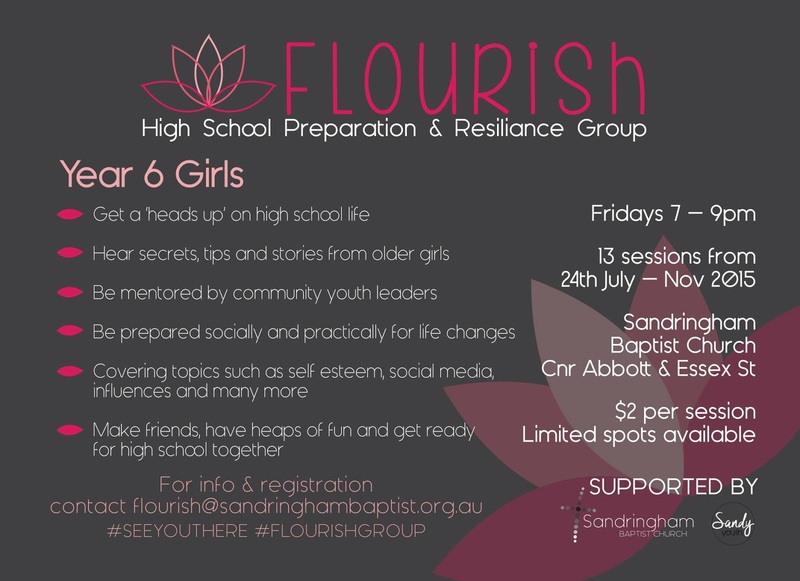 Email us at flourish@sandringhambaptist.org.au for a sign up form!